As discussed in the recent post on low employment ratio in the US, declining labor participation continues to be an issue. 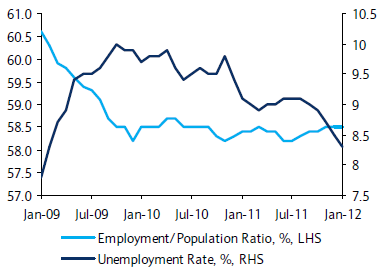 The chart below shows that as the unemployment rate declined recently, the employment ratio has not budged. The Fed pays close attention to this discrepancy - as they should. But how does one survive after losing the unemployment benefits? Clearly people struggle. One way to pay the bills however is to file for and receive the federal disability benefits - assuming of course one has a disability. Interestingly enough, the Great Recession and the slow recovery somehow generated many more disability recipients. JPMorgan: As of January over 8.5 million individuals were receiving federal disability payments (an additional 2 million spouses and children of disabled workers also received disability payments). 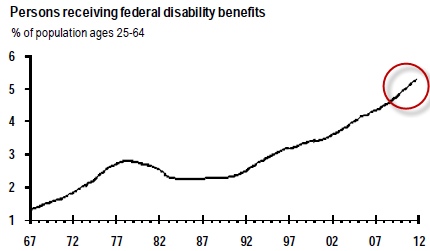 Since the onset of the recession and the subsequent slow recovery, this figure has accelerated and grown faster than the overall size of the potential labor force— currently 5.3% of the population aged 25-64 is on federal disability, up from 4.5% when the recession began. Half of the benefit recipients suffer from "mental disorders" and "musculoskeletal disorders" (such as back pain). "Mood disorders" alone account for over 10% of this group. And once someone starts receiving these benefits, it's almost impossible to take the off the program. In 2011 only 1% of the recipients lost their benefits because they were no longer deemed disabled. So how much is this program costing the US taxpayer? Apparently quite a bit. JPMorgan: The cost to the federal budget of these programs has escalated along with the number of claimants, and now runs around $200 billion per year—more than the budgets of the Departments of Commerce, Energy, Homeland Security, Interior, Justice, and State combined. Thus a quarter of people who drop out of the workforce and come off the unemployment benefits, simply move to receiving disability payments. And most stay there until they roll into the social security program when they retire - from their disability. The same source, a different program.